The world’s fastest growing threat to user data – ransomware – is the notorious malware strain that locks computer files using encryption and demands an online payment to restore access. In fact, close to $600 billion, or nearly one percent of global GDP, is lost to cybercrime each year. Despite how wily and sophisticated ransomware developers are becoming, you can apply proven methods and technologies to fend off their attacks, keep your business up and running, and remain compliant with industry and other regulations. With a practical, proactive approach, you can fend off attacks and keep your data safe. Find out how so you don’t fall victim. Businesses today increasingly view the cloud as an agile, efficient way to manage their IT needs: 58 percent are moving toward a hybrid IT environment and another 18 percent are looking to move completely to the cloud. As a result, the cloud computing marketing is on pace to reach $186.4 billion. Managed service providers (MSPs) need the right tools to stay in the game – and ahead of the competition. But many feel there’s never enough time to deliver on existing service level agreements (SLAs) and manage the business itself – let alone find new ways to expand. Join Mike Vogel for an illustrative, on-demand webinar that walks you through Acronis’ approach to cyber protection and how you can lower overhead while delivering multiple essential services. Take a few minutes to discover how you can start profiting by leveraging just one customizable solution that fits any business model. Ransomware, the notorious malware strain that locks computer files with encryption and demands an online payment to restore access to them, is world’s fastest growing threat to user data. Ransomware gangsters raked in $5B in extortion fees last year, and are predicted to loot nearly $12B from businesses and consumers by 2019. Ransomware developers have become increasingly wily, sophisticated and effective, but you can apply proven methods and technologies to fend off their attacks, keep your business up and running, and maintain your compliance with regulatory regimes like GDPR. 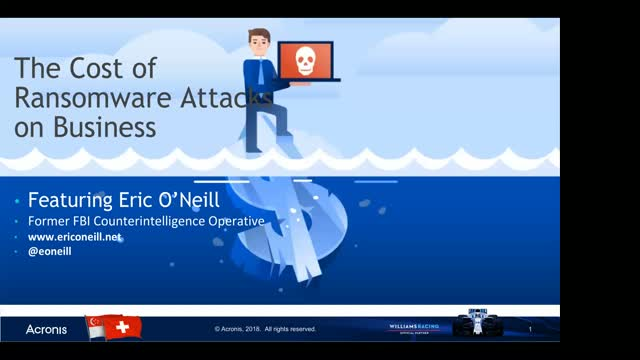 Don’t become another ransomware statistic: join this webinar for practical steps you can take to protect your organization from ransomware today. The complexity and occasional ambiguity of GDPR regulations can freeze some IT organizations into inaction. But neither your management nor your customers will wait forever for evidence of your progress toward GDPR compliance. Learn how to get out of the starting gate with these pragmatic, actionable tactics. James R. Slaby works in product marketing at Acronis, where his focus includes security-oriented issues like ransomware and GDPR. Before Acronis, Slaby was an industry analyst covering IT security, cloud computing, and networking at Forrester Research, HfS Research, Yankee Group, and The Info Pro. With over 300 published IT research reports, he has been quoted in The Economist, Wall Street Journal, New York Times, and countless tech publications. Slaby has also held campaign, solutions, vertical and product marketing roles at a variety of tech vendors including Sonus, Acme Packet, Bay Networks and Motorola.